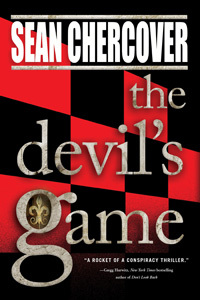 The Devil's Game by Sean Chercover: Synopsis and Online Purchase Options. Synopsis (from the publisher): Daniel Byrne spent ten years as a Vatican investigator, scrutinizing and debunking miracle claims — until he burned that life to the ground when one investigation shook his faith and revealed disturbing earthly conspiracies. Determined to find the truth, he steps into a new life of secrets and lies, joining a powerful group that wields hidden influence over world events.